Excellent batting of Virat Kohli and De Villiers destroyed Sunrisers Pune. The article speaks about great batting exhibition by Royal Challengers Bengaluru. Virat Kohli and De Villiers were awesome in the match. Virat Kohli heroics destroyed Pune Warriors. On 22nd April, 2016, Virat Kohli’s Royal Challengers Bengaluru destroyed Pune Warriors. Again it was an excellent exhibition of batting by Virat Kohli and De Villiers. Virat Kohli’s Royal Challengers Bengaluru scored 183 runs in 20 overs. Virat Kohli and De Villiers blasted the bowlers of Pune Warriors. Virat Kohli scored 80 runs while De Villiers scored quickfire 83 runs. Right from Asia Cup, Virat Kohli’s bat had ruled the world. He not only showed consistency with the bat, his brilliance had taken India to different frontiers. In the recently ended T20 World Cup Virat Kohli became the man of the tournament. It was another case that India’s bowlers could not rise up to the occasion and India lost to West Indies in the Semi-finals. But that does not take away the credit of Virat Kohli in combating every type of bowlers in different wickets. Right from Mohammad Irfan to Mohammad Sami, Dale Steyn to Morne Morkel, Hazzlewood to Bravo, all the bowlers were tamed by the bat of Virat Kohli. On Friday, he again played a brilliant innings. He played a waiting game. His partner Gayle had gone back to West Indies to see hi newly born son. Wicket keeper Rahul opened the innings with him but got out cheaply. From that time almost 15 overs were exhausted in building the innings by Virat Kohli and De Villiers. Virat Kohli did not go for risky slogging understanding the requirement of the situation. De Villiers scored three huge over boundaries. The tight bowling of Pune Warriors did not give scope to Virat Kohli and De Villiers to cut loose. They went for big shots in the last 2 overs and got out at that time. By that period a decent score of 183 runs were scored. Virat Kohli had a task of defending the title. Dhoni’s Pune Warriors made a bad start. Duplessis went for chip shot early and got caught out. Pieterson got a harmstring injury and could not bat. He got retired hurt. That left Ajinkya Rahane and Dhoni to rebuilt the innings. It was a difficult case. The weakest link of Royal Challengers Bengaluru is their bowling. They allowed Rahane and Dhoni to settle down. Rahane was excellent. He played a commanding innings and scored 60 runs. Dhoni scored 41 runs. Thereafter Perera tried his best by going for big hits. But at the end they were short by 13 runs. In the initial stage of the IPL, Kolkata Knight Riders had defended their scores the best because of their strong bowling. Mumbai Indians could not bat to their potentiality. What is evident is that team will win the IPL title which has a right balance of batting and bowling. None of the teams have a right balance. Kolkata Knight Riders had shown excellence with the bowling. Sunil Narine, Piyush Chawla and Shakib Al Hassan had their excellent bowling which befooled the batsmen of the opponent teams. The excellent spin bowling could not create predictability for the opponent batsmen. Morne Morkel and Umesh Yadav had done well with the pace attack as well. But the matches had exhibited great opening partnership of Gautam Gambhir and Robin Utthappa. Both had given opening partnerships of above 70 runs in every match. The middle-order batsmen Manish Pandey, Russel and Yusuf Pathan were not tested. In any match if both Gautam Gambhir and Robin Utthapa get out cheaply then it will be seen if Manish Pandey and other batsmen can pull the match on their shoulders. Mumbai Indians having the best batting line up had not batted to their potentiality. Neither Rohit Sharma had shown his actual skills, nor Buttler and Pollard was at their best in the initial matches. If they really bat well then other teams will face uphill task against them. David Warner had pulled Sunrisers Hyderabad on his own shoulders. 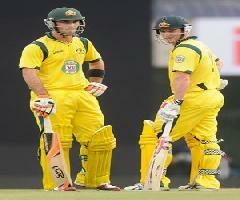 If in any match David Warner fails, then the potentiality of Shikhar Dhawan and other players will be tested. Kings Eleven Punjab had come to the bottom of the Points Table to failure of their major batsmen. Two of their big hitters including captain Miller and Maxwell had not performed at all. South Africa boasts about great batting of Miller while Australia boasts about great batting of Maxwell. Unless they perform it is difficult to post big scores. Gujarat Lions had done well due to the good batting of Suresh Raina, Brendon Mccullum and Aaron Finch. All the three had performed very well with their bat in majority of matches. The opening and first wicket stand had reached the team to at least 100 runs from where the middle order had done well. In respect of bowling till now Bhubaneswar Kumar wore the purple cap. He picked up wickets both in his initial spell as well the slog overs. But many bowlers had not performed to their potential. For example Brathwaite, Russel, Bravo had not used their slower deliveries and Yorkers to their potentiality. Among the spinners Amit Mishra, Ravichandran Ashwin, and others had not really created any impact in the tournament so far. T20 matches generally favour the batsmen. As the matches last only 20 overs, so batsmen can take ample risk. A quickfire 20 runs by any batsmen is helpful in the shorter version of the game. But if the bowlers are really good then in the short spell of 4 overs they can create an impact. From the initial matches, the trend shows that Mumbai Indians, Sunrisers Hyderabad, Gujarat Lions, Kolkata Knight Riders and Royal Challengers Bengaluru are the hot favourites to enter the semi-finals. The other teams had lost at least 3 matches and find themselves in difficult position to retain their position and enter the semi-finals. It is interesting to see how long the good teams can retain their forms. The tournament will continue for another 2 weeks. It will be difficult in the Indian heat to succumb to the conditions and do well. Whichever team will be able to cope up with it will win the tournament.